Pottery is an art that goes hand in hand with the history of man and civilization. It is said that the first known pieces were found in Japan between 400 and 10,500 BC (see A history of Pottery). Along the way, a slow wheel or tournette was substituted by the fast potter's wheel around 2000 BC. Potters between XIII and XV had enough tools and skills to produce house utensils and building materials on a big scale, thus developing social relationships around this market and more specialization. But I am not here to write a treaty on pottery. My mission is to attract your curiosity and pave the way to your own research on possible topics on the web. If this happy potter image in a medieval fair in Vic, triggered your intellectual hunger, then the goal has been attained. 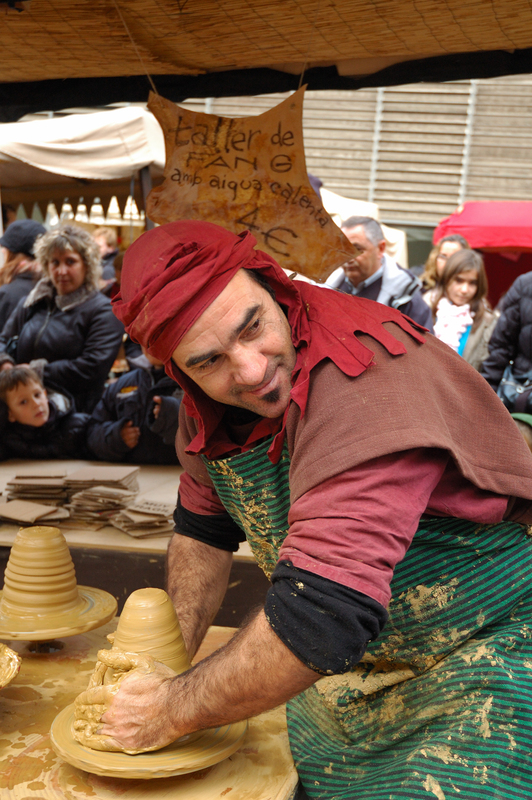 In case you want to know what the sign says in the background: Taller de fang amb aigua calenta is Catalan for clay with hot water workshop. Oh, a special image indeed, Carlos! This one really attracts my fancy, and yes, my intellectual hunger also. It is poignant to learn that pottery making began in Japan...thank you for the link for further reading. This one should go in book or featured in a gallery showing.